Historically, a root cellar is a place where our ancestors stored their root vegetables to keep them cool and fresh. 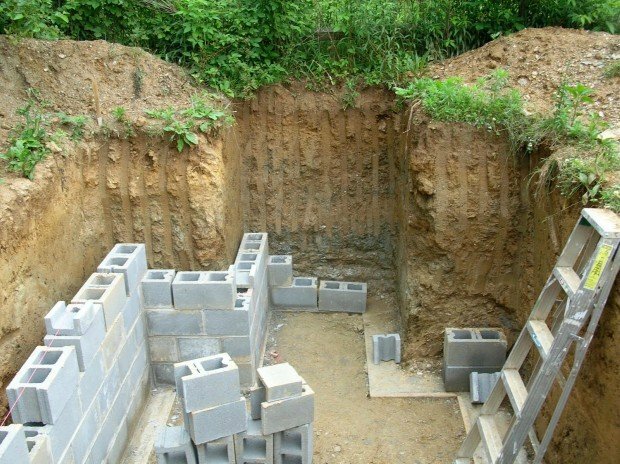 And while you can still build and use a root cellar for that purpose, there may be other things you want to create one for instead (and no, I’m not talking about the storage of dead bodies…. if that’s your idea then you’re visiting the wrong blog!). 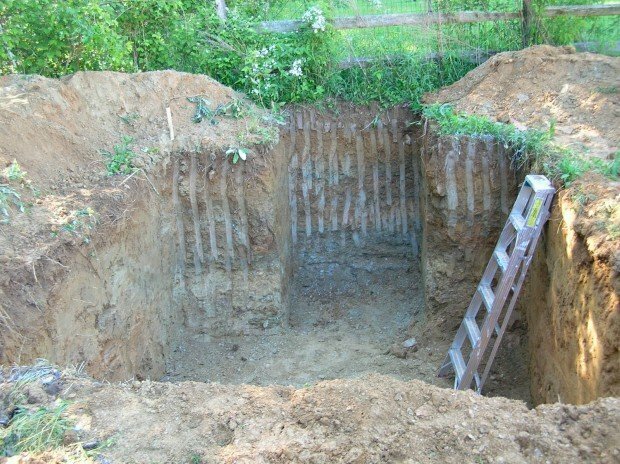 Anyhow, check out this photo gallery to see the step by step process of how Robert built his very own underground root cellar. What do you think? We decided that our little farm needed a root cellar to store our produce in. Step one: Dig a hole in the ground. We are fortunate to have a local gravedigger who is a real artist with a backhoe. Step two, pour a concrete footer. Then start laying blocks. A simple flat slab wouldn’t do, for you want condensation to run off to the sides. So, I created a plywood form with an arched top. A nice snug fit, supported by 3 vertical 2×4’s on each side. 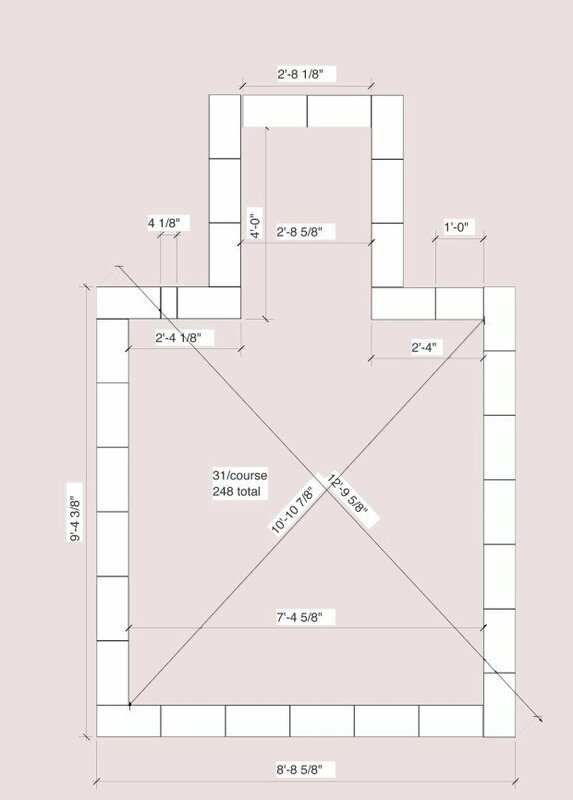 (Not shown in the picture are 8 pieces of 1/2″ plywood approximately 6″ x 23″. These were installed after the plywood sheets were added. 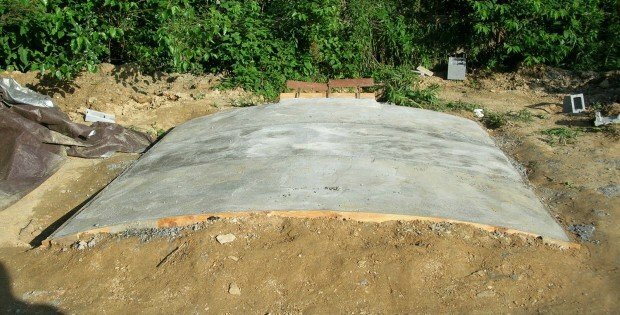 Next, add a perimeter to the form and pour concrete. 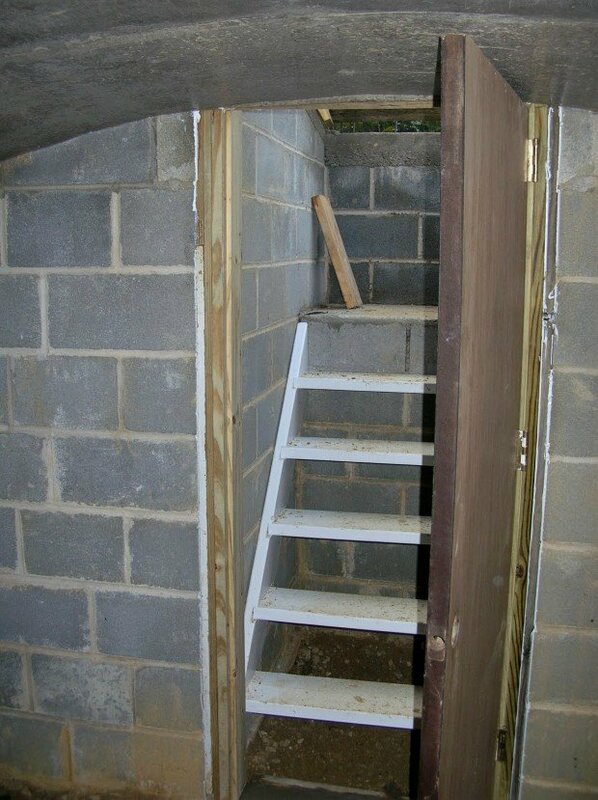 A view of the top before the entrance was completed and the cellar covered with 2 feet of earth. 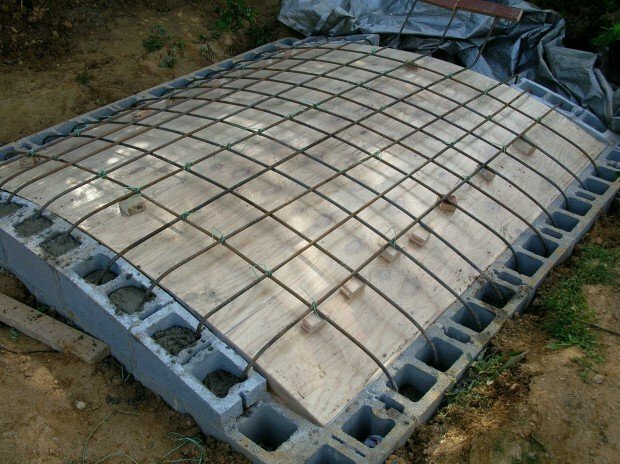 The wood at the rear is covering the ends of the rebar to prevent injury. Add stairs and doors at top and bottom, and you have a fine root cellar, ready for lots of fruits and vegetables. Currently we are storing apples, carrots and potatoes, and we are pleased with the results. He was very conservative and used 28 vertical supports. I used only 6. His roof weighed 5,000 pounds wet vs. my 4,000 pounds, therefore his supports were holding only 250 pounds each, while mine were holding 670 pounds. NEXT UP: An Off Grid Contemporary Lodge. Take A Look!